The Scyllarus Hyperspectral ZIP (HSZ) file format is a comprehensive format for Hyperspectral Images, based on the HDF5 file structure. Suitable for Research – the Scyllarus MATLAB® Toolbox can read and write this format. When Scyllarus processes a Hyperspectral image, it is broken down into several components – the basic image components that combine to make the final image based upon the dichromatic model (Finlayson & Schaefer, 2001). K and k are the specular coefficient and factor (a cube + matrix). Each of the above elements is stored within the hierarchical HSZ file, as its own field. The tool ‘HDF View‘ allows you to inspect a HSZ file and view its contents as raw data. The S component of the image is further decomposed by storing each pixel as a combination of a number of ‘materials’. By storing the data in this way, the sum storage space required by the components of the original ‘I’ is less than its initial size. The level of compression can be adjusted by varying the number of materials combined to recreate each pixel. 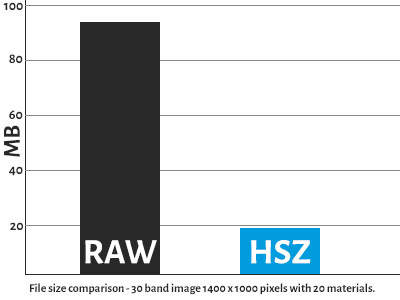 Storing an image in HSZ format does result in some minor losses of information, thought in most cases the reconstructed image has below 1% difference to the original. You can download the detailed HSZ format specification document here.